Under a cracked and wailing sky, the Misery is a vast and blighted expanse, created when the Engine, the most powerful weapon in the world, was unleashed against the immortal Deep Kings. Across the wasteland, teeming with corrupted magic and malevolent wraiths, the Deep Kings and their armies are still watching—and still waiting. Ryhalt Galharrow is no stranger to the Misery. The bounty hunter journeys to a remote outpost, armed for killing both men and monsters, and searching for a mysterious noblewoman. He finds himself in the middle of a shocking attack by the Deep Kings, one that should not be possible. Only a fearsome show of power from the very woman he is seeking saves him. Review: Its been a long time since I've come across a fantasy that was unique and breathtaking. 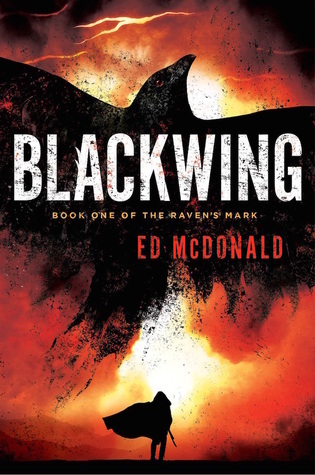 Blackwing takes you to an old west type setting with strange magical creatures that are dangerous and hard to kill. I really enjoyed how the story just threw you into the Misery, a barren wasteland of death. You could feel how heavy the air was and how our main character, Ryhalt Galharrow and his band of Blackwing Mercenaries are tired of the long road. There are so many twist and turns in this awesome fantasy. It was a great read.